SULU, Philippines (Mindanao Examiner / Apr. 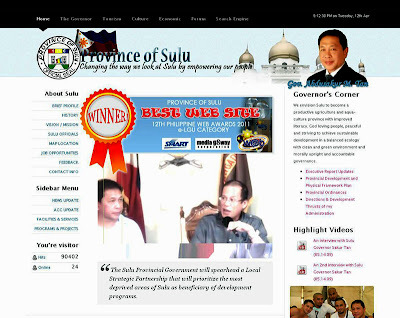 12, 2011) – The Provincial Government of Sulu has won the coveted “Best e-LGU Website” at the prestigious 12th Philippine Web Awards 2011. Sulu, one of five provinces under the Muslim autonomous region, bested three other provinces and two highly urbanized cities which were finalists for the prestigious award. The others were the municipality of Del Carmen in Surigao del Norte, Padada municipality in Davao del Sur, Lanao del Norte, and the cities of Zamboanga and Manila. Del Carmen municipality also bagged the “People’s Choice” award. The awarding was held April 8 at the Carlos P. Romulo Auditorium, RCBC Plaza in Ayala Avenue in Makati City. It recognizes the best Filipino-created web sites and honors the individuals and teams behind them. The PWA said it continues to attract participants in the Philippines and abroad and gain support from major industry players.